Hey again its S here! 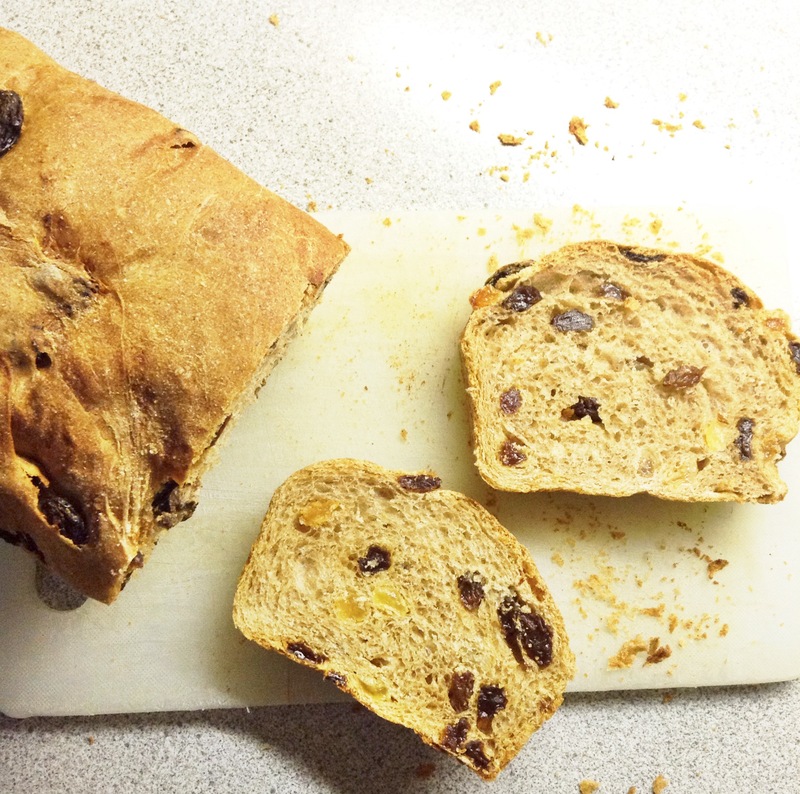 I’m back to share a delicious yet healthy Cinnamon Raisin Bread recipe. I know what your thinking, healthy = not so good tasting, right? Wrong. 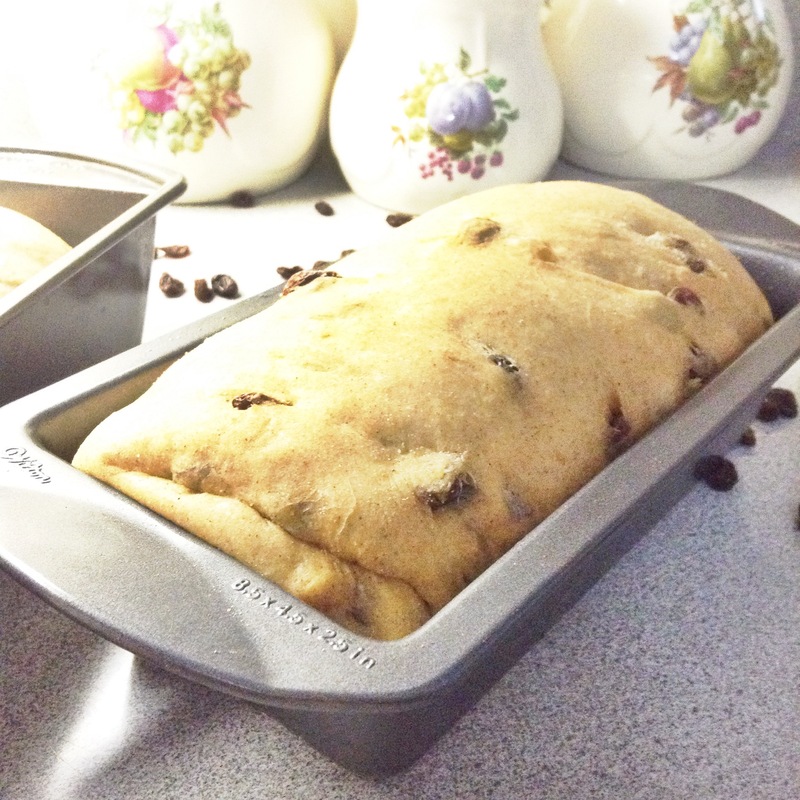 This Cinnamon Raisin loaf is everything you want it to be. Soft, moist, flavorful, cinnamon-y, with the perfect level of sweetness. Trust me when I tell you you’ll want to make it over and over again. So this is a recipe I like to say I “healthified”. I seriously loved the Sun-Maid brand Cinnamon Raisin bread but after looking at the laundry list of unnecessary ingredients, I knew I needed a substitute. Since I do like to eat fairly healthy I wanted to make this a bread I can pop into the toaster in the morning and eat alongside my cup of tea. 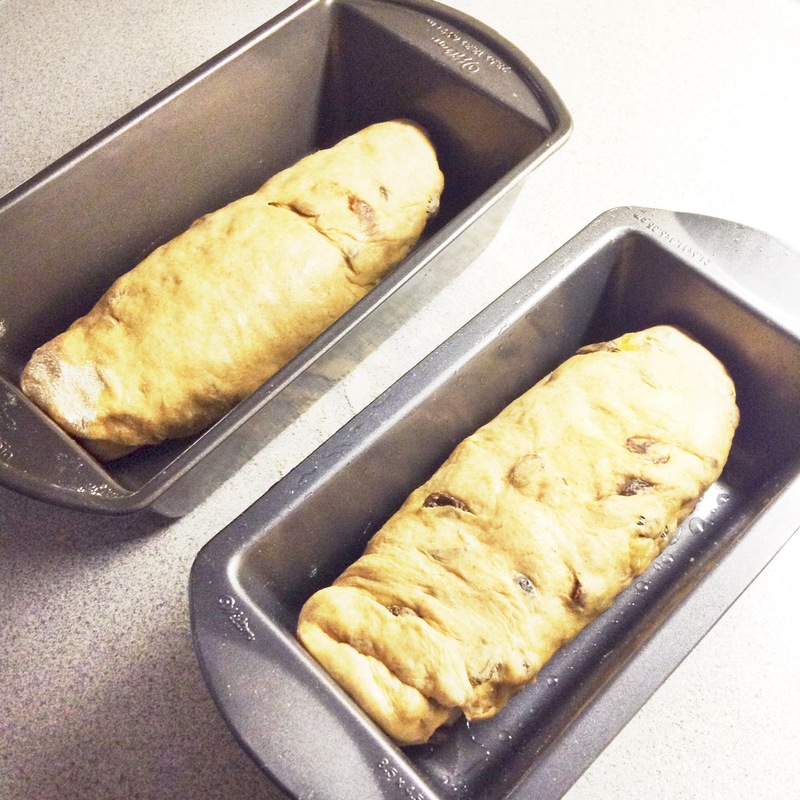 After a couple trial and errors and a pat on the back, I come to you with a delicious recipe for Cinnamon Raisin Bread! After the first rise your dough should have doubled in size. Make sure your yeast has activated when you make your dough or you’ll end up with a mess on your hands. LOL this one time I remember making a loaf of bread and I accidentally used dry active yeast when the recipe called for instant yeast and let me tell you, I waited and waited. Divide the dough into two… pretty self explanatory. By the way in the recipe I use a 1:1 ratio of whole wheat flour and all-purpose flour. I haven’t experimented but you can always sub for all whole wheat, you might get a slightly denser dough but it will taste good nonetheless. And that my friend is the power of yeast. I don’t know about you but it’s always so rewarding to see your bread has risen. So soft and pillow-y. If that’s not perfection, I don’t know what is. The loaf should be a beautiful golden brown and pop right out of the pan.Your house will smell so delectable and inviting. The cinnamon scent is just so welcoming! 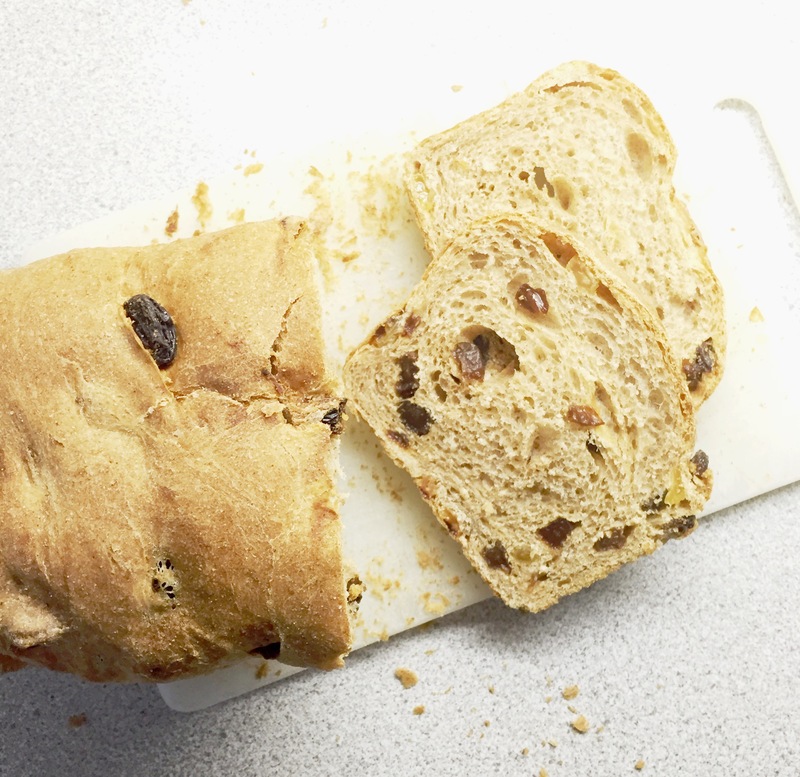 Those raisins give such a pleasant sweetness there’s no need for the extra sugar in store bought bread. With the black raisins I also threw in some golden raisins for that extra yumminess. My family including my picky little brother love it! 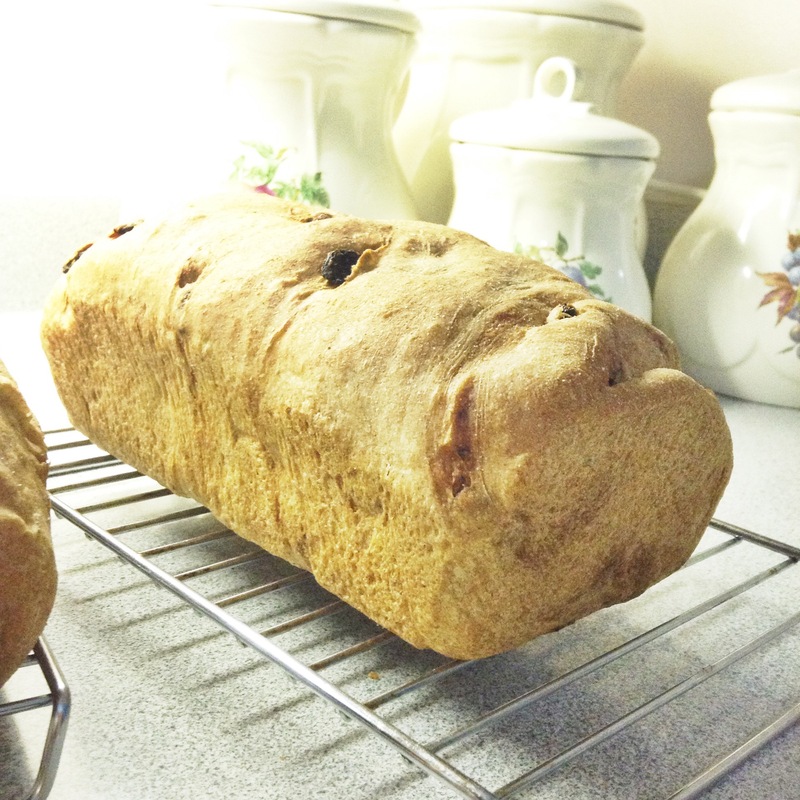 If your a fan of Cinnamon Raisin bread I guarantee you will like this recipe as much as we do. 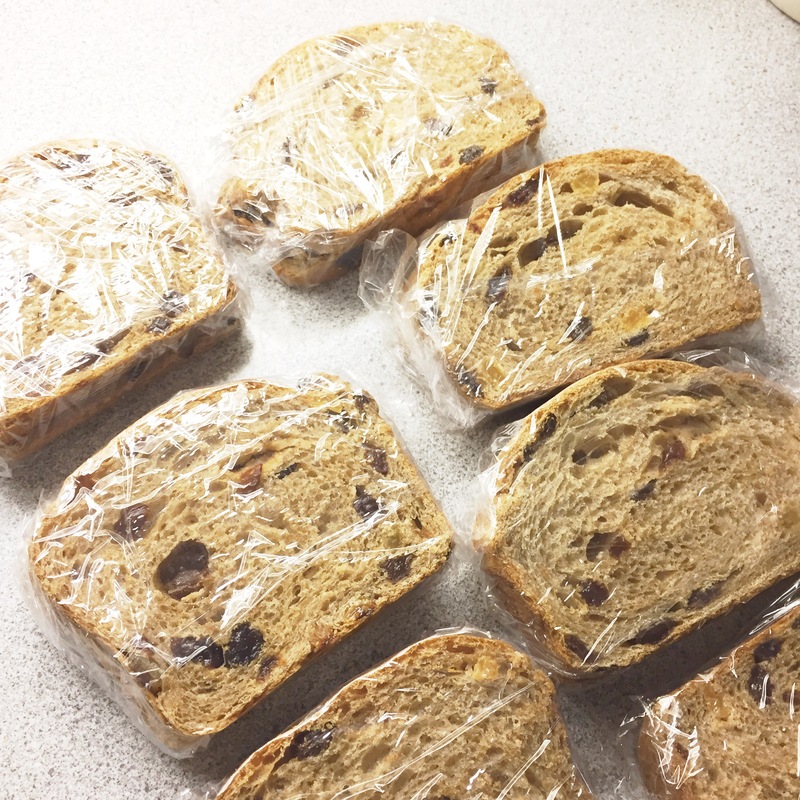 After the loaves have cooled I like to wrap them individually in two’s in cling wrap and pop them into the freezer in a large freezer safe Ziploc bag. That way I can have some fresh homemade bread whenever I like without it being stale! Stir together your flours, coconut sugar, salt, and cinnamon in a medium sized bowl. In a separate bowl add the yeast and honey in the warm water, let it sit for approx. 5 min to let the yeast proof. Mix the egg, coconut oil, and milk into the yeast mixture and stir till combined. Add the flour mixture to the wet ingredients and knead till the dough comes together. 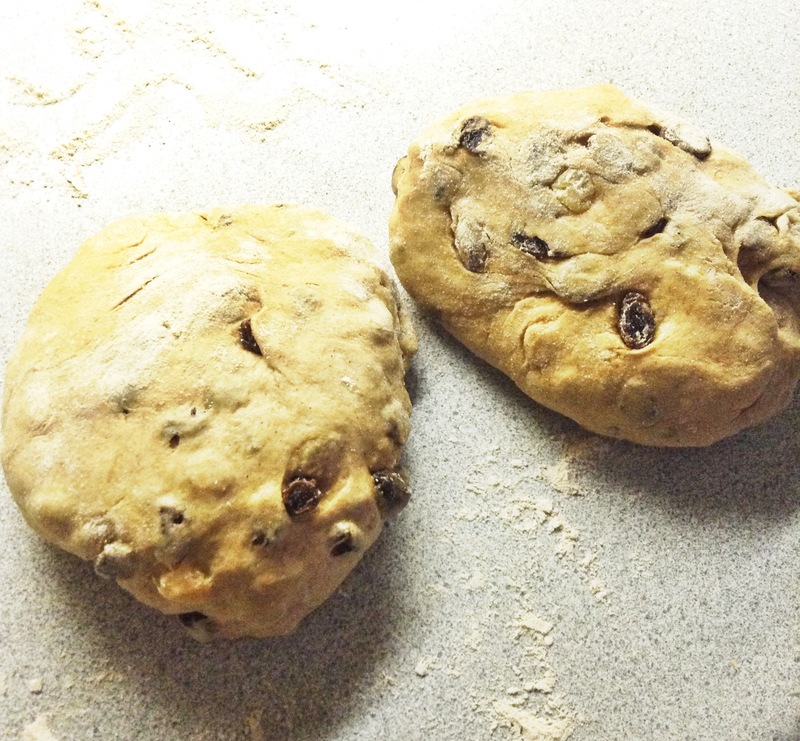 Slowly add in the raisins a little at a time and knead till combined. It should be tacky but shouldn’t stick to your hands. If you need more flour add about a tablespoon at a time until you get the proper consistency. (Also if you have a stand mixer you can use it with a dough hook on 1-2 speed). Place the dough in a slightly oiled bowl, cover and let it rise for 1 ½ – 2 hours till it’s doubled in size. Divide the dough in half and roll each out with a rolling pin to about a 1/4″ thick squares that are about the length of your loaf pan. Roll the squares into a log and pinch the seams together. Place them seam side down into your loaf pans, and cover with clean kitchen towels for about 1 hour to rise. Bake at 325 F on the middle rack of the oven and bake for 20 minutes. Rotate the pans and bake for an additional 10-15 minutes. These times will vary depending on your oven. The finished loaves will be golden brown on top and will make a hollow sound when knocked on. Make sure you let them cool completely before you slice or else they will l dry out as they cool. Tags: baking, bread, breakfast, cinnamon raisin, delicious, healthy. Bookmark the permalink.